Like its predecessor, Transformers 4 is once again tearing up the streets of the Windy City. Director Michael Bay and a new cast lead by Mark Wahlberg are currently shooting the next installment of the franchise in downtown Chicago, where there are plenty of folks with camera phones and good enough access to provide a direct account of the happenings. While little is known regarding the plot of the film, we have seen some images emerge from the set in recent weeks that tease new characters and vehicles. In addition, we now have some interesting inclusions to the set design that may offer a hint to not only the film’s story, but also the eventual marketing campaign. Hit the jump for more. The provided images come courtesy of Seibertron (with additional thanks to FirstShowing for the heads-up), who also acquired video from the shoot that shows lots of people running, a helicopter flying low over the Chicago River, and explosions—just in case you were not already convinced that this was a Michael Bay production. The images pretty well confirm Transformers 4 will continue the universe created in the previous trilogy despite the new lead and cast. 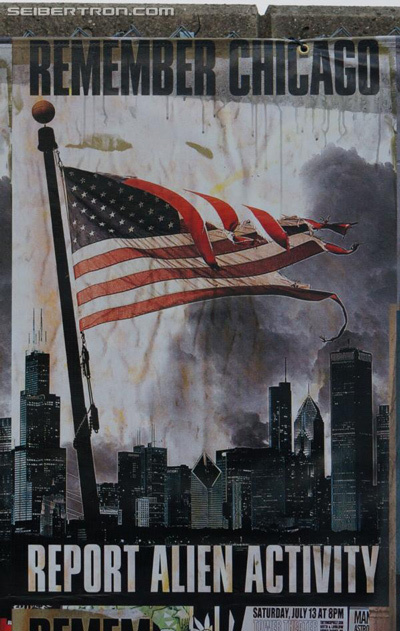 There are references to the battle of Chicago, and propaganda-style posters that highlight humanity’s recognition, and distrust, of “aliens.” Instead of Barack Obama adorning a poster that says “Hope,” it is Optimus Prime accompanied with the word “Hate.” And the well-known “see something, say something” campaign to root out potential crime and terror appears to have been modified to apply to Autobots and Decepticons. The posters look like they provide nice set dressing to reinforce the apparent tone of the film, that humanity has come to fear and resent the Transformers after the leveling destruction of the previous movies (can you blame them?). I think these same symbolic images can be used further in the film’s eventual marketing campaign, similar to how Pacific Rim used their own propaganda posters as part of its promotional efforts this summer. Even for those that did not care for Transformers: Dark of the Moon, the scope and destruction seen in the final battle in Chicago likely left a lasting impression. Since there has been confusion over whether or not Transformers 4 is a reboot, using these images will help moviegoers identify what to expect from one of next summer’s biggest blockbusters, and draw them back into the Transformers world. You can view all of the images at the Seiberton website. 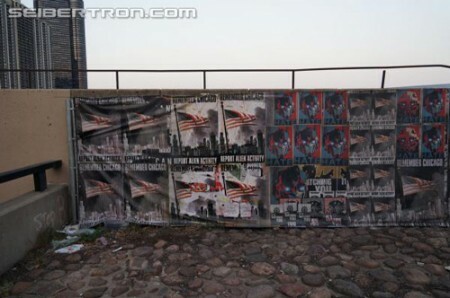 Do these posters make you more excited for Transformers 4? Or do you think the franchise needed a complete reboot? Sound off by leaving a comment below.